Like cleavage, the $249.95 price tag is front, center, and something always on your mind even as you list off the other good reasons you want to spend time with Turtle Beach's Ear Force PX5. You can talk about the fully customizable audio presets, the 7.1 channel surround sound quality, the Bluetooth support with multiple device pairing. And we do indeed respect the PX5 for those qualities. But at bottom, this is one hell of a set of cans, which any dude would love to play with. How much is too much? That $250 price tag is actually $50 less than the latest Bose noise cancelers, and lines up reasonably against professional grade headphones, too. But can something that costs as much as the console you're using it on still deliver value? Turtle Beach has become somewhat synonymous with console gaming audio; "my Turtle Beaches" means whatever you slap on your head when you're getting serious about the wet work in Black Ops. The company supplies a broad line of products supporting mainly the PS3 and Xbox 360, at a wide range of prices. The Ear Force PX5 is its newest high-end model, surpassing the X41 by about $50 in price, with a ton of extra features. They're headphones, you put them on and hear stuff. But there is some pairing involved, and it's surprisingly pain free. Pairing the device with its transmitter is a two-step snap. Pairing it with USB devices (or the PS3 chat) is also a standard process, and it smoothly remembers what it's paired with when you turn it back on. Two volume controls handle audio from Bluetooth and the transmitter; an included Xbox 360 chat cord manages volume from that source (the controller). Cycling audio tuning presets is done with a button on the left ear cup. Mike muting and Bluetooth command buttons are on the right cup. The power button is on the left side, above the mike boom, and has a cool blue flash when it's on. Don't feel like chatting? The mike is removable. Superior Sound: This is a pair of headphones, after all, and straight away we can check off "Can be used to hear things." Of course, for $250, it has to be much more than that. The base sound profile supplies more than enough immersive sound without overwhelming you with noise. Even driven up to the highest setting on the dial in MAG, while what I got was definitely loud, there was no ear-ringing or distorted quality and zero ambient hiss. Without getting too far into jargon, the PX5 recreates surround-sound audio as if you were listening to a very high-end speaker system. The transmitter is susceptible to interference from a wireless router but this popped much, much less than my Ear Force X31s. The difference is, the acoustics are much more controlled in the earcups than they would otherwise be in a living room.On that note, the unit is an attractive black, fits snugly, and becomes barely noticeable 15 minutes into your gaming. Loads of Options: You start with eight audio presets each for for the PX5's PS3 and Xbox 360 mode. In addition to driving up the bass for jaw-rattling explosions, they do things like boosting the stereo range, so you can better hear sounds to your side, to "Footstep Focus," which reduces gunfire to a tinny rattle while amplifying ambient noise nearby. From there, you can swap out additional presets from a library on the Turtle Beach site or, in the future, even edit your own sets to do things like morph your chat voice, or hush mike audio that's prone to outbursts (or your own). 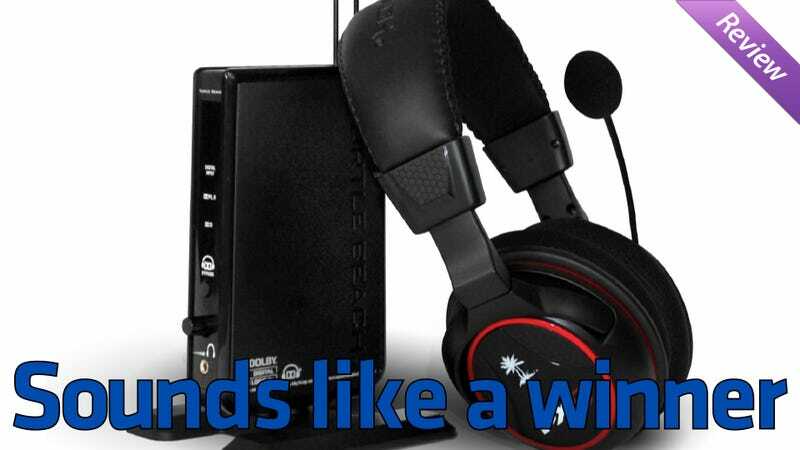 That will be accomplished through an advanced sound editor that Turtle Beach expects to roll out, free, in April. The application that downloads and reorders presets (via USB cable to the headset) is, currently, PC only. Turtle Beach says it plans to support Mac OS and will likely begin porting its applications after the sound editor arrives next month. Bluetooth Bonus: As Bluetooth is how PS3 voice chat gets done, Turtle Beach went whole hog and packed a bunch of extra functionality in along with it. The PX5 will pair simultaneously with your PS3 and a Bluetooth-enabled mobile device. Not only does that mean swapping over to take a phone call with the touch of a button - and it truly was just that easy - you may also use it to listen to audio from a Bluetooth-enabled device (with A2DP audio support) while you game. I listened to sports radio from an iPhone app while playing Tiger Woods PGA Tour 12; The Masters, for example. Bluetooth audio came in crystal clear from A2DP sources, with slight hum during dead silence. Well Adapted: With one console, you'll want to use the supplied digital optical audio cable into the PX5 transmitter (assuming you have a PS3 or the newer Xbox 360 S. If you have the older-model 360, you must get the 360's AV adapter). Its digital audio out port means the transmitter's useful as a hub that routs your TV and game console audio, all-in-one, over to a home theater system. As I have multiple consoles, after hearing it serve up digital optical audio, I split the analog audio of my signal switcher to the PX5's transmitter and the video capture device I use, and still got above average, enjoyable sound. Naturally, this would work as a headset for my PS2 and Wii on the same switcher, or for my television, or anything else with an analog-out port. Analog audio background hum on the PX5 is a bit louder than Bluetooth but easily drowned out by low-level atmospherics in a game. Little Things: The headset itself is battery powered; Turtle Beach wisely separated the Bluetooth and main audio power, so you may run it without Bluetooth draining the battery. With both on, Turtle Beach estimates you'll get 15 hours of life on two double-A batteries. Without Bluetooth, your batteries will last between 20 and 25 hours. The headset has an auto-off feature that powers it down if it hears no audio for 5 minutes - useful if you turn off your console but forget the PX5. Also, I really appreciated an actual voice prompts telling me (in the main audio, not Bluetooth) which preset I was on, what mode I had selected, and if the headset had entered into pairing mode with the transmitter, rather than trying to decode bleeps and blips. The literature says you may even change out these prompts for other voices. Nits to Pick: Though the PX5 is luxury upon luxury, it has a few small areas where it's not optimized for certain minorities of the user base. Mac users and old-model Xbox 360 users, as mentioned before, are two, though the latter is hardly Turtle Beach's fault. But multiconsole users, whom I'd guess would be the kind of power users with the money or the motivation to lay $250 on a gaming headset, have to make some choices, too. There is no power supply for the PX5 transmitter. It's powered by USB, taking up one of two slots you might be using on your PS3 or 360 for a keyboard (like me, in D.C. Universe Online) while you recharge another controller. More importantly, it means that console must be on to power it even if you're using another (with analog audio coming in). I solved this with an old USB wall charger I got from a Jawbone three years ago. Yes, I can strongly recommend the Turtle Beach Ear Force PX5. I can also strongly recommend a Ferrari over a Honda Fit. But expensive doesn't mean impractical, provided you have the itches the feature-packed PX5 will scratch. If you are a console gamer who is that picky about your sound, this is priced alongside high-end noise canceling headsets and delivers more options. And the clarity of the audio the PX5 delivers, the point of all this, is absolutely bulletproof. I have a pair of trusty Ear Force X31s and it's going to be hard to go back to them - sorry, I don't get to keep this unit. I'll be sad to see it go. But I do have a $300 tax refund coming and I'm ... well, yeah, I'm thinking about it. The Turtle Beach Ear Force PX5 gaming headset is manufactured by Turtle Beach and is compatible with the PS3 and Xbox 360. Used on both consoles, with both digital optical audio and analog audio, with games such as MAG, Call of Duty Black Ops, Fight Night Champion, MLB 2K11 and Tiger Woods PGA Tour 12: The Masters. Available at retail now, for $249.95. A unit was loaned to Kotaku for this review. Caressed its supple cups before tearfully saying goodbye.